Piedmont is a region in northwestern Italy that is surrounded by the Alps on three sides; this lent the region its name, as Piedmont means "foot of the mountains." Piedmont borders France and Switzerland, and shares many things in common with its neighbours - hardly surprising, as Piedmont was occupied by the French from the 11th century to the modern age. In all that time Piedmont was the territory of the House of Savoy, a powerful French royal dynasty that ended up ruling Italy from 1861 until 1946, when the monarchy was abolished. This hilly region is a favoured destination for Alpinists; Piedmont offers an excellent base for climbing and hiking adventures, while skiers will enjoy hitting the slopes at the Chisone and Susa valleys. Piedmont is famous for its gastronomic riches, which include the precious white truffles of Alba and many fine wines, including Barolo, Barbaresco, Dolcetto, and Moscato d'Asti. The region's small towns often celebrate food festivals in the harvest season. Turin started life as a Roman camp in the first century BC. The legionnaires laid out the camp in a regular grid that still defines the city's network of streets today. Around 1050, Turin began housing the court of the Savoy dynasty that ruled Piedmont. In the 13th century, it was annexed to the Duchy of Savoy and became its capital in 1563. In the 19th century, after the unification of Italy, Turin briefly served as the new country's capital, before this status was given to Florence and finally, Rome. Turin is recognized worldwide as the home of the Holy Shroud. Surprisingly, it also has the best Egyptian museum in Europe, in the Museo Egizio. It's also a vibrant, cosmopolitan city marked by sharp contrasts: it's a city of museums, but also a centre of business and industry (Italian automaker Fiat is based in Turin). It is famous for its rich cafe society; wander over to Piazza San Carlo, where you'll find local intellectuals sipping bicerin and arguing politics in attractive cafes that serve some of the best-tasting coffee and chocolates anywhere. Turin is a gateway to the Alps, which make a lovely background to its elegant neoclassical villas and Baroque palazzi. Turin has a less attractive side as a major industrial city and a magnet for immigration. Sometimes called the "Detroit of Italy," Turin has long been associated with the auto industry as well as the aerospace sector. Italy's early film industry was partly developed in Turin; this era is now commemorated in the National Museum of Cinema, housed in the Mole Antonelliana, a building whose striking spire defines Turin's cityscape. 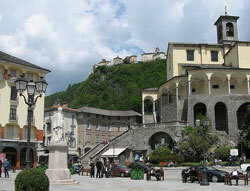 Turin's La Collina district is an affluent haven set upon the hills just outside of the main city. La Collina enjoys many large green spaces, and features the surpassingly elegant Basilica di Superga, known for its imposing neoclassical portico.